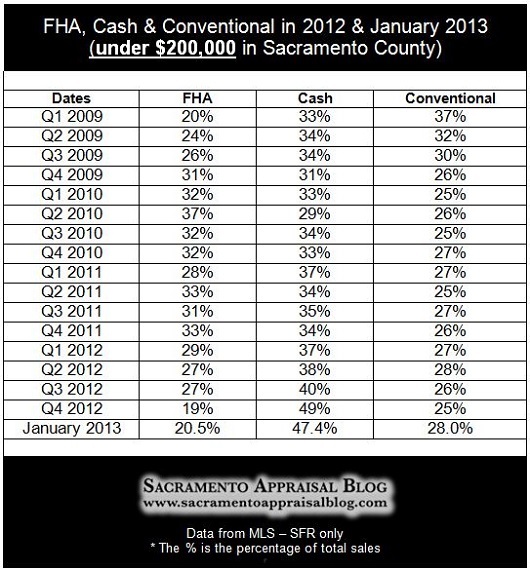 We are seeing fewer foreclosures lately in Sacramento, which is a good thing. But at the same time, the foreclosure rate going down seems in part be a result of more effectiveness with short sales. This is important for consideration since short sales are still considered distressed sales and very often sell for less than traditional sales and even foreclosures (depending on condition of course). As you can see in the chart below, the overall percentage of distressed sales has remained fairly similar over the past few years (but definitely down from stats in 2008 when a wave of bank-owned sales hit the market). Is this interesting to anyone besides me? Or am I just a numbers geek? For reference, The Sacramento Business Journal reported yesterday on a decreased level of notice of defaults (NODs) during the first quarter in both California and Sacramento County. Theoretically, if there are less defaults this year, we should see the percentage of foreclosures continue to decrease. The Point: We are seeing glimpses of recovery in the housing market, but the market is still distressed. Let’s take any good news in context.